As a national advocacy organization, our core work is supporting and advocating for Women of Color and Organizations by and for Communities of Color. To accomplish our goals, we employ a multi-strategy approach of Supporting and Enhancing The Leadership of Women of Color, Training and Technical Assistance, and Policy Advocacy. The National Organization of Sisters of Color Ending Sexual Assault (SCESA) is an advocacy organization of Women of Color dedicated to working with our communities to create a just society in which all Women of Color are able to live healthy lives free of violence. Our purpose is to give voice and develop action strategies that incorporate and address the experiences and realities of Women of Color and Communities of Color. …We will continue to strive for success in creating a world where sexual assault no longer exist and all Women are able to live lives free of violence. Women of Color have played important roles in the movement to end sexual assault. However, the number of Women of Color in leadership and their access to influence policy decisions and social change has been limited. Far too often, Women of Color are hired to work within their communities without the ability to direct and decide what strategies should be used and how those strategies will be implemented. SCESA is committed to enhancing and supporting the natural leadership of Women of Color. Our leadership projects are intended to nurture, promote, cultivate, enhance, and sustain Women of Color leadership using an intensive model of culturally specific training, skill-building tools, resources, and support. SCESA focuses on redefining the concepts of leadership to allow for connections to our cultural roots. This includes the ideas of sharing, nurturing and the notion of cyclical leadership. Cyclical leadership acknowledges the responsibility of all Women of Color to work in the community (and in sisterhood) with each other agreeing that no Sister is successful unless all Sisters are successful. 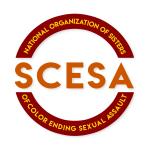 SCESA has worked to educate and increase the awareness within Communities of Color and the broader society about the prevalence, incidence, and issues related to sexual assault in Communities of Color. We provide training and technical assistance addressing sexual assault and Communities of Color to national, state, territorial and community-based organizations. We provide culturally appropriate and relevant technical assistance to community-based Communities of Color organizations that will support their efforts to create and/or strengthen effective responses to end violence against women in their respective cultural communities. Partnering with the U.S. Department of Justice, Office on Violence Against Women to provide technical assistance to grantee programs addressing sexual assault. Involve direction and critical input by Advocates of Color and Organizations by and for Communities of Color. SCESA also participates with other national organizations in collaborative efforts that focus on social change initiatives that address violence against women as well as other forms of oppression. Overall, our efforts are aimed at a long-term strategy to protect, ensure and expand public policy issues that impact on Women and Girls of Color. Working with Territorial programs and coalitions to craft and ensure the inclusion of language for equal funding for the U.S. Territories throughout formula programs in the Violence Against Women Act.